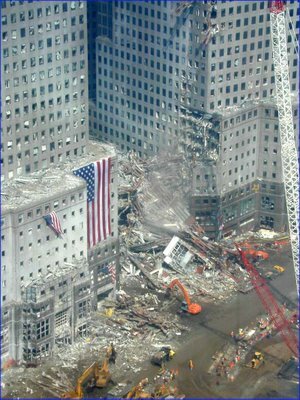 The time-date stamp of this post is 7:46 a.m. CDT (8:46 a.m. EDT), September 11, 2006 -- exactly five years after Mohammed Elamir Awad al-Sayed Atta flew American Airlines Flight 11 into the north tower of the World Trade Center. Atta was an Egyptian-born Muslim who was recruited into al Qaeda in 1998. Al Qaeda is led by Osama bin Laden and dominated by adherents of Wahabism, a fundamentalist sect of Islam. Al Qaeda is one of dozens of Islamic terrorist organizations, many of which are devoted to Islamism -- "a set of political ideologies that hold that Islam is not only a religion, but also a political system that governs the legal, economic and social imperatives of the state according to its interpretation of Islamic Law" -- and to jihad in pursuit of Islamism. 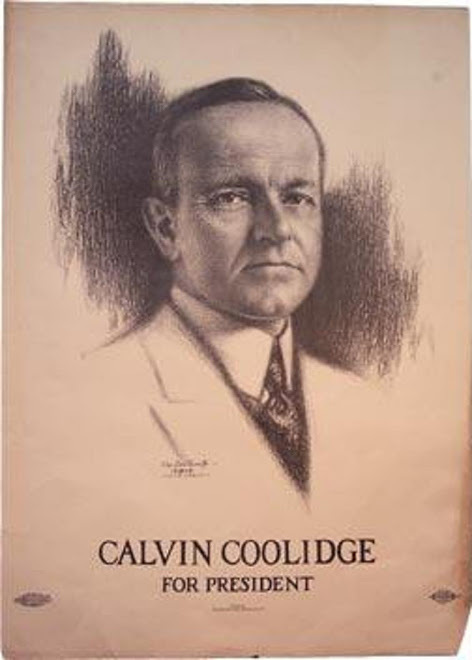 Those terrorist organizations that are not devoted to Islamism, as such, are nevertheless motivated by an intolerance for non-Islamic cultures in general, a jealous hatred of Western civilization in particular, and a zeal to eradicate Israel, which is an outpost of Western civilization in the midst of Muslim lands. 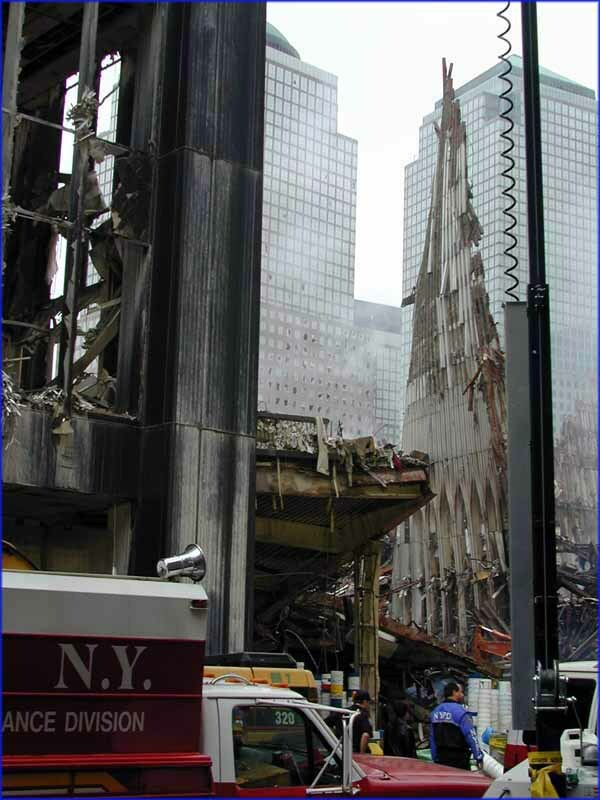 The attacks of September 11, 2001, underscored what had been true for years -- and what remains true today -- which is that America and the West are chosen enemies of Islamist jihadists. Those who ignore that truth are doomed either to die at the hands of Islamists or to suffer under their rule. When my wife and I turned on our TV set on the morning of September 11, 2001, we learned that a plane had, minutes earlier, struck the north tower of the World Trade Center. 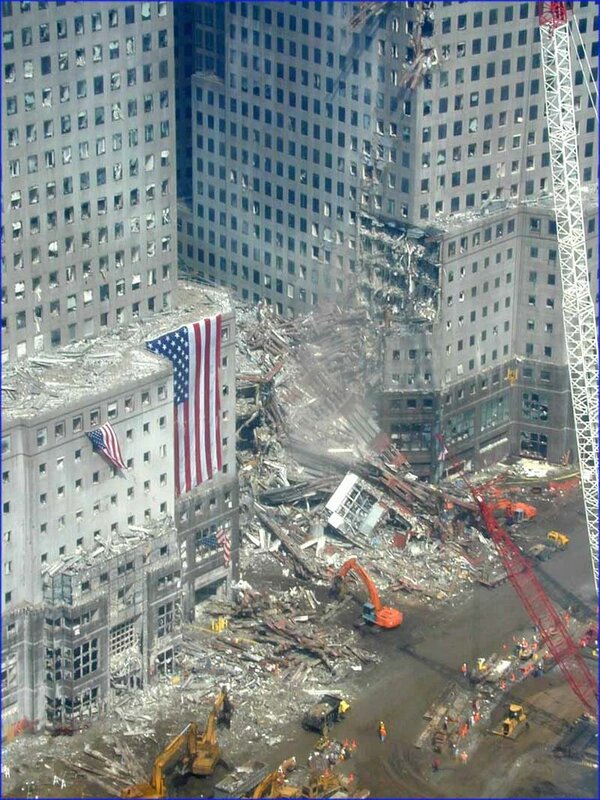 Minutes later we watched in horror as a second plane soared through the bright blue sky and struck the south tower. And with that horror came the understanding that America had been attacked. That understanding soon was confirmed when -- in the awful silence that had fallen over Arlington, Virginia -- we could hear the "whump" as a third plane slammed into the Pentagon. Our shock and rage were accompanied by fear for our daughter, whom we knew was at work in the adjacent World Financial Center when the planes struck the World Trade Center. (See photos below.) Was her office struck by debris? Had she fled her building only to be struck by or trapped in debris? 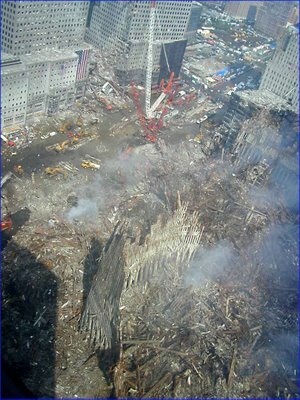 Had she smothered in the huge cloud of dust that enveloped lower Manhattan as the towers collapsed? Because telephone communications were badly disrupted, we didn't learn for several hours that she had made it home safely, before the towers collapsed. Our good fortune was not shared by tens of thousands of other persons: the grandparents, parents, brothers, sisters, husbands, wives, children, grandchildren, lovers, and good friends of the 3,000 who died that day in Manhattan, the Pentagon, and western Pennsylvania. I was enraged by the events of September 11, 2001, and I remain enraged. I am, of course, enraged at the perpetrators and those like them who remain at large. I am, if anything, even more enraged by those of my fellow citizens who seem unable to grasp the fact that terror is the fault of terrorists, and that the United States must defend itself against those terrorists, even if it means that we are at times inconvenienced and at other times deprived of a smattering of privacy. Those who lament inconvenience and conjure a police state where there is none are rank narcissists and untrustworthy companions in the fight to the finish in which we are engaged. I have reserved a special place in hell for those politicians, pundits, journalists, celebrities, and bloggers (especially Leftists and anarcho-libertarians) who criticize the war effort simply for the sake of criticizing it, who exude schadenfreude when there is bad news from the front or when the administration suffers a political or judicial setback in its efforts to combat terrorists, and who are able to indulge themselves precisely because they live in a nation that affords them that luxury. It is not a luxury they would enjoy under Leftist or Islamist rule. A time of war is a time for constructive criticism, for being on the same team and helping that team win by offering ideas about how to win the war. When your country loses a war, you do not win. In fact, you cannot win, unless you choose to join the other side -- and the other side chooses to accept you. But, as always, be careful what you wish for. Never forgive, never forget, never relent. What I Said about Climate Change . . .
Is the State Necessarily Paternalistic?